Arleigh Kincheloe, aka Sister Sparrow, mesmerized a full house at Levon Helm Studios in Woodstock Saturday night. With the Dirty Birds backing her, she held the audience entranced, proving one’s presence can dwarf their stature. The setting, a barn-turned-showroom, was ideal as onlookers surrounded the band and Sister Sparrow’s voice reverberated majestically. 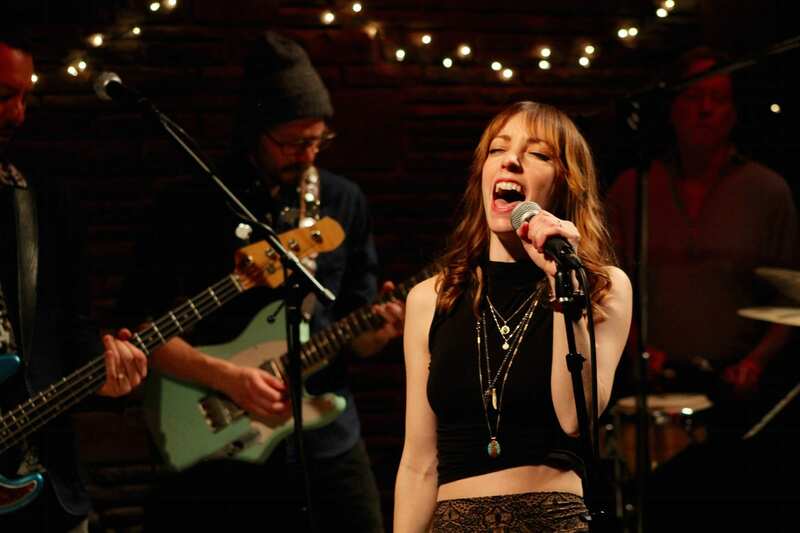 The show, Sister Sparrow & The Dirty Birds’ second at Levon Helm Studios, was long-awaited. SS&TDB were scheduled to make their first appearance in Woodstock since 2012 last December 29. Due to illness, however, the concert was rescheduled for January 26. If good things are worth the wait, the band can be forgiven for the near-seven year hiatus; they were excellent. When concert-goers arrived in Woodstock, they waited a little longer for the headliner as Melanie Glenn, Mary Kenney and Allison Olender, of the band Upstate, opened with an a capella set. While they typically play with a backing band, the set highlighting the singers was apropos for the intimate Levon Helm Studios. The sincerity of their voices manifested in calls and responses, gospels mixed with folk, and the three young ladies had evident chemistry. Expressive and at ease on stage, each singer had her own style and personality: Glenn took the limelight at one point with an acoustic guitar and Olender later came to the front with her electric Fender. Kenney anchored the set, standing center throughout. While Sister Sparrow would come out to steal the evening, Upstate’s harmonies set the mood wonderfully. After a brief intermission, the Dirty Birds took the stage and, with the audience’s enthusiastic encouragement, Sister Sparrow crept up to the spotlight. With a playful look of surprise for the applause (“Who– me?”) and a shake of her long, red hair, she grabbed the mic and it was off to the races. She’s tiny. She’s huge. The microphone stand rivals her in stature, but Sister Sparrow’s presence is titanic. 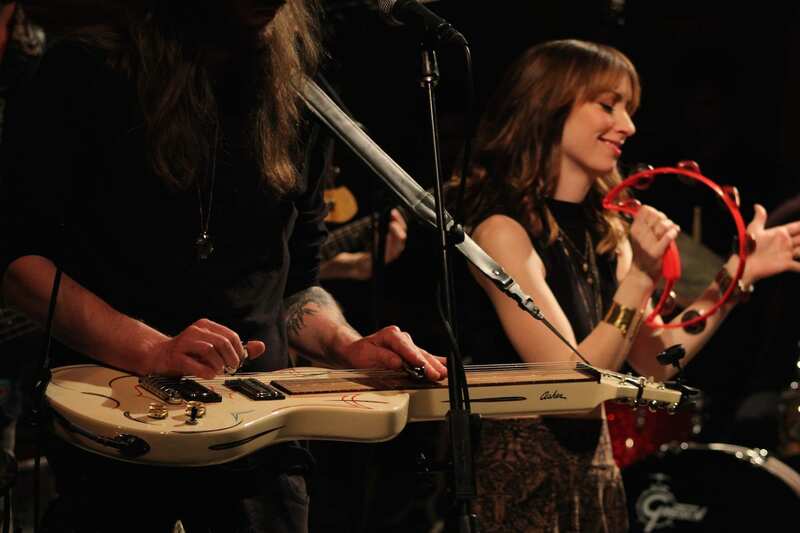 With her mother watching from the crowd and her brother Jackson supporting on the harmonica, Sister Sparrow banged her bright red tambourine, swung the mic, and belted out invigorating tunes. Sister Sparrow watching over the Dirty Birds. The sounds ranged from pop to folk, prominently featuring funk and soul. Sister Sparrow’s candid mien was positive and jocular, her voice captivating. The show was intimate yet energetic, and, from the beginning, there was a feel in the air that something special was taking place: refreshing music created by from experienced entertainers. The Barn at Levon Helm Studios had a church-like feel Saturday night. Rows of worshipers sat in awe as Sister Sparrow & The Dirty Birds held the pulpit. The music had a soul-cleansing component and the crowd was a lowercase-c catholic cluster of Dirty Bird disciples. While it was my first time attending a Sister Sparrow sermon, I most certainly hope it’s not my last.